Stick a fork in a Bull Netch to make sure it's done. Speak to the statue of Sheogorath at the shrine of Ihinipalit in the St. Delyn Canton. Travel to the far end of the Sheogorad Region and speak to Big Head to receive the Fork of Horripilation. Kill a Giant Bull Netch with the Fork of Horripilation. Return to the shrine to receive your reward of the Spear of Bitter Mercy. Sheogorath's shrine is easier than most to find, being in the Ihinipalit shrine in the Underworks of Vivec's St. Delyn Canton. You may need to take care of the current occupants to ensure that you have the privacy you need. 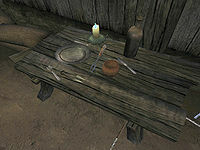 Activate the shrine to speak to Sheogorath who wants you to recover the Fork of Horripilation from a mad hermit near Ald Redaynia, on the long island north of the main land, and use it to kill a Giant Bull Netch that lives on the island that is directly east of Ald Redaynia, where Nelas Ancestral Tomb is. The hermit, Big Head, is found in his shack, which is on the island directly north of Ald Redaynia. Though the hermit is indeed mad, he is not dangerous, (and his head is no larger than any other Argonian's) and you can ask him about the Fork and he'll let you take it. He doesn't say where it is, but you can find it on the table looking like a large barbecue fork. Now, off to kill this giant netch (which is also no larger than any other netch) with a large fork... and you wonder why they call Sheogorath the mad one? The trick is that Sheogorath just said you had to kill the netch with it, so just use whatever weapon to beat the netch down and use the Fork to finish it off (much easier in the latest patch that shows the creature's health). An even easier way to do this is to kill the bull netch and then switch to the fork as the death animation plays and before your journal updates. You can also cast a spell that does damage over time, and draw the fork as it dies. Once you kill the netch, return to the shrine. You'll receive your reward, the Spear of Bitter Mercy. The Giant Bull Netch is located on the island due east from where you get the fork, not on the same island. Once you give the fork to Sheogorath, it's gone forever. The word "horripilation" is another word for goose-bumps. Big Head and the Fork make a reappearance in Shivering Isles, during The Fork of Horripilation quest. Size apparently isn't a factor in this quest, considering 'Big'-head's head is normal sized, and the 'Giant' bull netch is normal sized. Although you can get the Fork at anytime, the Giant Bull Netch will not appear on the island until Sheogorath gives the quest. Big Head makes a reference of the Bull netch in The Shivering Isles when you finish his quest and ask him about sword training. "Big Head knows a secret about blades. Point them out, never in. Blade is out - poke, poke, poke! Kill the grandpa netch!" These Codes can be used along with the Journal Console Command and Quest ID given within the chart to update the quest to a certain point. 10 I have entered the Shrine of Sheogorath and spoken with the Daedra Prince of Madness. He has offered me the opportunity to perform a service for him. First, I am to recover a powerful artifact, the Fork of Horripilation, from a mad hermit who lives on an island off the northernmost points of Tamriel. Then, I must slay a giant bull netch that has taken residence near this island. If I can do this, Sheogorath promises I will be rewarded well. 20 While in Dagon Fel, I asked about the madman about whom Sheogorath spoke. They tell me there is an Argonian named Big Head who lives on an island north of Ald Redaynia. 30 I have found Big Head, and he is without a doubt a madman. I only hope he can lead me to the Fork of Horripilation. 40 I've asked the madman about the bull netch, and I believe he knows of it. It is hard to tell what he knows and what he simply imagines. I should be able to find it on an island east of here. 50 The madman Big Head has the Fork of Horripilation in his possession, and he has told me I can have it if I wish. 55 The giant bull netch is dead, as Sheogorath asked. However, I was not wielding the Fork of Horripilation when the netch met its end. My quest for the Prince of Madness is a failure. 60 I've used the Fork of Horripilation to kill the giant bull netch. Sheogorath is testing me, clearly. I have no doubt he is enjoying this greatly. I must now return to Sheogorath with the Fork. 70 Finishes quest I've returned to the Shrine of Sheogorath, and the Daedra Prince spoke with me again. He seemed pleased that I had completed my quest...not because he wanted the bull netch dead, but he enjoyed seeing me struggle to do it. He has rewarded me well, though, and given me the Spear of Bitter Mercy. Esta página foi modificada pela última vez à(s) 05h30min de 27 de agosto de 2013.